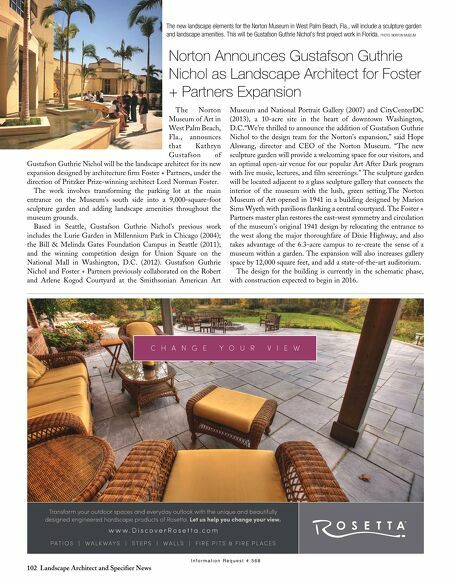 June 2015 103 I n f o r m a t i o n R e q u e s t # 5 5 4 I n f o r m a t i o n R e q u e s t # 5 5 6 PlayPower sells its commercial playground equipment under a number of brand names, including Miracle Recreation Equipment, pictured here. This 'Mega Tower' structure at Belle Valley School in Belleville, Illinois, with a 14-foot Tube Slide, 'Flippopotamus' and 'Fossil Bluff' climbers and 855 degree 'Typhoon' slide, was part of "Elementary, My Dear," a 2013 LASN June feature www.landscapeonline.com/research/ article.php/17890 . Littlejohn to Acquire PlayPower Holdings, Inc. Littlejohn & Co., LLC www. 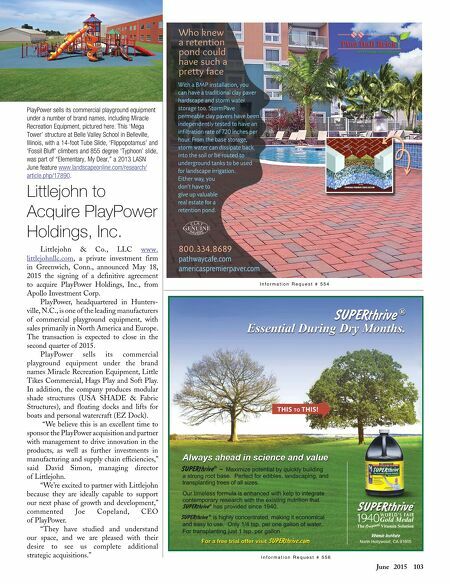 littlejohnllc.com , a private investment firm in Greenwich, Conn., announced May 18, 2015 the signing of a definitive agreement to acquire PlayPower Holdings, Inc., from Apollo Investment Corp. PlayPower, headquartered in Hunters- ville, N.C., is one of the leading manufacturers of commercial playground equipment, with sales primarily in North America and Europe. The transaction is expected to close in the second quarter of 2015. PlayPower sells its commercial playground equipment under the brand names Miracle Recreation Equipment, Little Tikes Commercial, Hags Play and Soft Play. In addition, the company produces modular shade structures (USA SHADE & Fabric Structures), and floating docks and lifts for boats and personal watercraft (EZ Dock). "We believe this is an excellent time to sponsor the PlayPower acquisition and partner with management to drive innovation in the products, as well as further investments in manufacturing and supply chain efficiencies," said David Simon, managing director of Littlejohn. "We're excited to partner with Littlejohn because they are ideally capable to support our next phase of growth and development," commented Joe Copeland, CEO of PlayPower. "They have studied and understand our space, and we are pleased with their desire to see us complete additional strategic acquisitions."